To quote What The Flick?! in their Austen like prose, “Tom Bennett is $*#%*#% hilarious in this movie” 9.3 out of 10 stars for Whit Stillman’s Love & Friendship. Tagged: Jane Austen, Love & Friendship, Review, Tom Bennett, What The Flick?! A great hangout movie doesn’t lack plot—it’s liberated from plot. When you remove the obligation to keep a story moving, a skilled director can allow characters to explore unresolvable questions. Metropolitan is an exemplar of this tricky form. The Sally Fowler Rat Pack—named for the upper crust kid whose parents’ apartment is the venue for these chatty all-nighters—may be a bunch of rich kids, but they’re highly aware of their privilege. Still, even if they reject the snobby rituals they’re expected to perform, nobody offers a convincing replacement. Marxism? Cynicism? Fatalism? They try ideas on for size, like a meaning-of-life dress fitting. They cling to the traditions of the Christmas debutante season, because they’re unsure about what happens next. And Metropolitan never provides the kids with a clear resolution, because it’s too much fun to watch them cast about for answers. Can a Cup of Coffee With Whit Stillman Change Hans Morgenstern’s Mind About “Damsels” (Part 1)? In this part one interview, Hans Morgenstern at Independent Ethos rethinks his bad review of Damsels in Distress over a cup of coffee with Whit Stillman. In this first part interview they talk about the bad review and among other things, technology in films and how it dates things (sometimes in unintentional comic fashion). All in all an interesting an insightful read. Look for part two in a jiff. 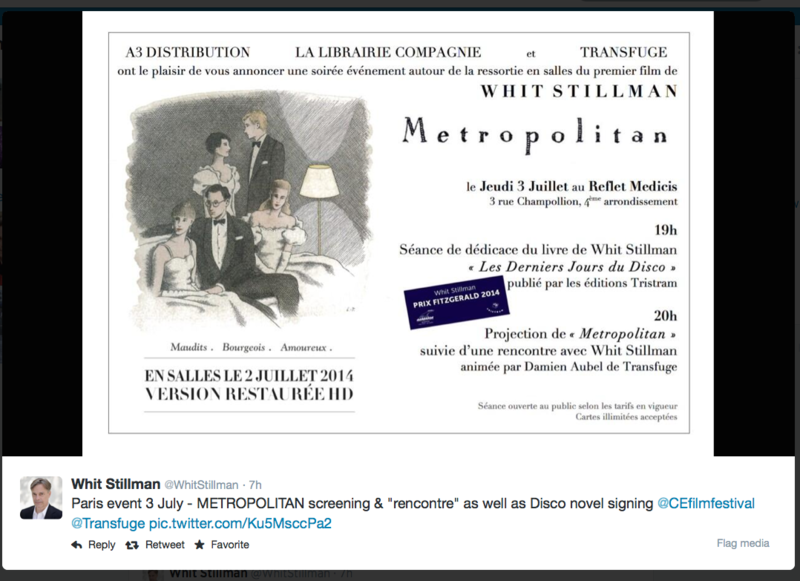 Whit Stillman: Oh, yeah, I was going to say A (laughs). Of course, it has to be my first choice, because of course you haven’t lost your knack for smart writing, which was option B. But you don’t think Millennials are too dumb to speak the same language as the generation before them, which was C? I didn’t quite get that point. It sounded interesting, but I didn’t quite get it. So, let’s go back to the ‘90s, think Richard Linklater. That was another very smart peer of yours during the rise of ‘ 90s indie film. I came of age in college watching these films. So when I think of those characters, I feel they seem as intelligent as I had felt, whereas the characters in Damsels don’t seem as bright. Thirteen years is a long time to come up with a new film, especially when your first three films were quite highly regarded at the time they were released and are even more highly regarded now. That’s exactly the story with Whit Stillman, one of the leading lights in American independent films in the early ‘90s alongside now almost forgotten names like Hal Hartley, Jim Jarmusch and Spike Lee. In fact, you can actually say it’s 14 years since his last film, “The Last Days Of Disco”, was released in 1998 and his latest, “Damsels In Distress”, was released earlier this year (though it did premier at last year’s Venice Film Festival, which was held at the end of 2011). Most people nowadays will know and have high regard for the films of Wes Anderson and Noah Baumbach, both quite famous for their unique way with dialogue and the very particular kind of acting in their films.